Since the first Torch Run at the Olympic Games in 1936, the Torch Run is one of the most important parts of the Opening Ceremony. The history of the Olympic fire goes back to Greek antiquity when it was ignited in the honour of the goddess of Hestia. For Special Olympics World Games in Abu Dhabi 2019, this flame has a different but an equally important meaning. The Law Enforcement Torch Run (LETR) started in 1981 in Wichita, Kansas when Police Chief Richard LaMunyon recognized a lack of awareness and a need to raise funds in order to offer people with intellectual disabilities opportunities to practice sport and send athletes to the Special Olympics. Since then, a mixed group of law enforcement officials and Special Olympics athletes have united together to form the Final Leg Team who serve as the “Guardians of the Flame” in the Torch Run. Today more than 97,000 law enforcement members in 44 countries—including 50 US States and 12 Canadian provinces—ensure the delivery of Special Olympics Flame of Hope to the Opening Ceremonies of World Games. What started 35 years ago as a symbolic gesture has developed rapidly to a fundamental fundraising campaign which has generated $619 million dollars since the inception of the run. Those funds came from a number of events including Torch Run T-shirt sales, “Tip-A-Cop”, “World Largest Truck Convoy” and others. The funds are used so that more athletes can benefit in many areas of their lives through sports training and competition. But it is not all about the money. This year the Torch Run started on 3 March in Abu Dhabi and went all through every corner of the United Arab Emirates, and the nation’s 7 Emirates including Fujairah, Ajman and Dubai, to end up perfectly timed back at the Zayed Sport City Stadium for the Opening Ceremony in Abu Dhabi. Every step the “Guardians of the Flame” took increased awareness for Special Olympics World Games and promoted powerful messages of inclusion and acceptance. Every step they took along the way was an opportunity to enlighten communities about the Special Olympic Games. Their common will for a glorious and spectacular event connected the runners and the people of UAW and made the Opening Ceremony what it was—impressive. As the last torch runners entered the stadium on Thursday night, they were welcomed with roaring applause and witnessed the feeling of humanity that Special Olympics athletes convey through each of their competitions. Every representative of a Special Olympics region lit a torch as a sign of solidarity and solemnity to open Special Olympics World Games in Abu Dhabi 2019. 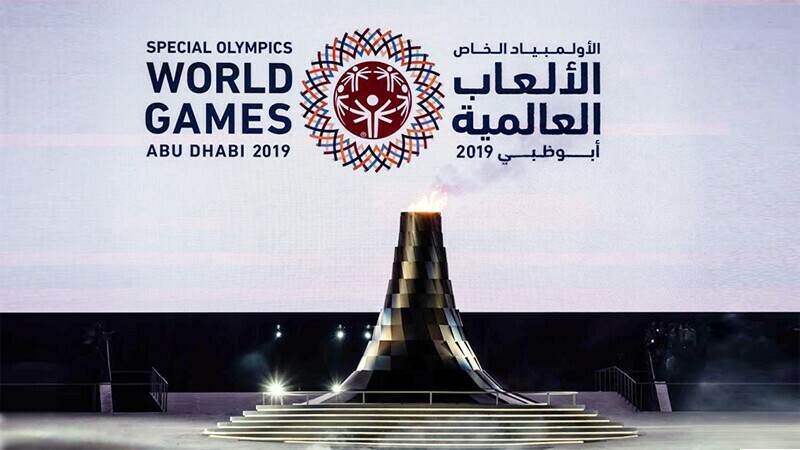 This article was produced as part of the AIPS Young Reporters Programme at Special Olympics World Games Abu Dhabi 2019, generously supported by the Lions Clubs International Foundation (LCIF).